Washington (CNN) – President Barack Obama plans to announce former Sen. Chuck Hagel as his nominee to become the next defense secretary and Counterterrorism and Homeland Security Adviser John Brennan as the nominee for CIA director on Monday, administration officials told CNN. Two sources close to Hagel have also been told to expect the defense secretary announcement on Monday, and additional sources - a senior administration official and a source familiar with the nomination - said Obama spoke to Hagel Sunday by telephone. The White House was calling senators' offices Sunday to inform them Hagel's nomination is imminent and to help build support for it, a source familiar with the nomination said. CNN reported Friday that the White House had told some senior members of Congress to expect the tapping of Hagel, and another source with knowledge of the nomination called it "locked down." At the CIA, Obama plans to nominate Brennan to replace retired Gen. David Petraeus and acting CIA Director Michael Morell, according to a senior administration official. The announcement is expected Monday afternoon at the same time Obama nominates Hagel, the official said. Petraeus stepped down from his post in November amid revelations he had engaged in an extramarital affair with his biographer. Morell, a career intelligence officer who was serving as the spy agency's deputy director, stepped in as acting CIA director upon Petraeus' resignation. For Hagel, getting to the Pentagon will mean overcoming already vocal opposition from pro-Israel groups and others who object to his stance on Iran and Hamas. He has also faced opposition from gay rights groups, who were strong supporters of Obama's election campaigns, for a comment Hagel made in 1998 in which Hagel questioned whether a nominee for ambassadorship was suitable because he was "openly, aggressively gay." He apologized for that remark in December. On Sunday, Republican Sen. Lindsey Graham labeled Hagel's expected nomination as "in your face," expressing concerns on CNN's "State of the Union" about Hagel's past positions on Iran and Israel, which have been the subject of scrutiny since his name was first floated as a potential defense secretary five weeks ago. Republicans have also struck upon comments in a 2007 interview that some perceive as anti-Jewish, when Hagel said the "Jewish lobby intimidated lawmakers." They've also lambasted positions Hagel took as a GOP senator, including his opposition to unilateral sanctions against Iran, as well as votes opposing the labeling of Iran's Islamic Revolutionary Guard Corps as a terrorist organization. He also opposed the "surge" of troops in Iraq favored by then-President George W. Bush and members of his administration. Sen. Mitch McConnell, the Republican leader in the Senate, said Sunday that Hagel would receive a "thorough vetting" just like any other presidential nominee. "Whoever is nominated for secretary of defense is going to have to have a full understanding of our close relationship with our Israeli allies, the Iranian threat, and the importance of having a robust military," McConnell said on ABC's "This Week." "So whoever that is I think will be given a thorough vetting. And if Sen. Hagel is nominated, he'll be subjected to the same kinds of review of his credentials as anyone else." A veteran of the Vietman War, Hagel served, by a clerical mistake, side by side with his younger brother, and earned two Purple Hearts, one of those for saving his brother's life. His time in Vietnam would end up forging his thoughts about combat for the rest of his life, and defining his tenure on Capitol Hill as a U.S. Senator with an independent streak, often sidestepping his Republican colleagues. "Not that I'm a pacifist, I'm a hard-edged realist, I understand the world as it is, but war is a terrible thing. There's no glory, only suffering," he is quoted in his 2006 biography. If he is confirmed, Hagel will face the challenge of closing the final chapter on the U.S.-led war in Afghanistan and oversee the continued footprint of a smaller U.S. training force there. Hagel has been critical of U.S. policy in Afghanistan. In 2009 he opposed Obama's move to surge 30,000 troops into Afghanistan, telling the National Journal, "I'm not sure we know what the hell we are doing in Afghanistan." Perhaps the most immediate issue facing Hagel if confirmed as defense secretary would be the future of the Pentagon's budget. Hagel has said in the past that be believes the Pentagon's budget is overweight. CNN's John King, Athena Jones, Gloria Borger, Mark Preston, Dan Lothian, Lesa Jansen, Mike Mount, Kevin Bohn and Kevin Liptak contributed to this report. The most important selection criteria for the DEFENSE JOB, should be that he knows the different "ideologies" (such as Asian, in particular the dangerous "Korean ideologies"), and what they mean, what makes them dangerous (incl. what technology they use) and how to be successful in defense (and not lose). If not successful in defense the USA risks losing many friends, many allies (incl. NATO alliance), many US businesses. And that is NOT acceptable. Wow...finally someone who does not pay credence to the United States of Israel. Are we going to appoint someone who is going to work for United States or Israel? Republicans do not like him because they consider him a turn-coat on their party, not because of anything substantive. It is also a chance to label Obama as an extreme President. A perfect example of when the republicans really were the grand old party. His lack of mean spiritedness and possession of a working, thinking brain make him a party outcast. IF the republicans win the house in 2014 – I'll be a monkey's uncle. The way obama constantly & continues to reach across the Isle, simply amazes me, I mean, he's got the republicans in awe, continually. The one Rabbi CNN was able to get to stand out in support of Hagel leads at an interfaith church for Jewish, Christian, and Muslim peoples alike. Another example of compromising ones faith to be "politically correct," or seem accepting of all people. The simple fact should be that he is Jewish and stands for one God. Respecting people is one thing, people should always be respected. But you don't have to open an interfaith center...unless you don't stand firm in your own faith. This is the man supporting Hagel, who has made several anti-semitic remarks, and supported several pro-iran bills while in the senate. The US always should stand behind Israel. The role of Congress according to the Constitution and precidence is "advise and consent" regarding cabinet appointments. This pertains to a judgement and confirmation of competence, not political orientation. The President deserves to select his own cabinet and adisors who represent him and his policies. This should not be a tug-of-war over points of view, rather of vetting background and fitness for the job. Rarely has a nomination for cabinet resulted in a rebuke for political views. A word to Republicans intent on dragging out Hagel's nomination; do your job but leave the current environment of negative politics, win at all costs, out of it. Let the process of confirmation begin. Ask questions, let Mr. Hagel answer, then decide. Anyone in congress should look at themselves not as an example because they have not acted in the best interest of the USA. It does not make any difference who is defense secretary if we do not keep spending money on the military.Stop military spending and you will bring on a recession for sure.Catch 22,our government.Spend like there is no tomorrow,live on the credit and see what happens.Nothing has changed and trying to deal with a bunch of Muslims is a good indication of an idiot before he gets the job.
" I AM NOT A SENATOR OF ISRAEL, I AM A UNITED STATE SENATOR " Senator Hagel was quoted to have said when pressured by the Israeli lobby . WOW !! What a breath of fresh air and courage in the halls of Congress !! A U.S senator standing up for the interests of the USA ! !...For that he's villified !! Come on people, WE ARE THE UNITED STATE OF AMERICA NOT OF ISRAEL !! Lieberman cant go war with Hamas,elections, Israel cuts a deal, It has nothing to do with him. Same as Petreaus after his reading of comments, which he made public. Stand in the way, stand in front of a confirmation. The United States of America, its people, and its military, are under zero – and I do mean ZERO obligation to help a tiny foreign state which is *actually* wiping a country off the map, and which despicably summons the memory of the Holocaust to declare criticism of its unequivocal *war crimes* [per multiple NGOs, e.g. during Cast Lead] as 'antisemitism'. This is the great trick of the Zionist 5th column – criticizing ample examples of Israeli state terror and racism is "antisemitic". The state of Israel, while I wish the best for its everyday people, is not worth one drop of American blood. Remember the USS Liberty. The Lavon Affair. The Dancing Israelis. American rural, poor, Christian boys are under no obligation to defend a tiny foreign country – and those in congress who bow to the Israel Lobby and its ongoing thirst for blood are guilty of TREASON. I'm tired of Lindsey Graham's posturing, his opinion is worthless. What I've read about Hagel has more positives than negatives. He knows first hand all about war and combat and had the moral sense to stand up and come out against the Iraq war when he saw how pointless it was. It seems he wants to use common sense in our dealings with Israel instead of blind knee jerk reactions to everything and anything they might concievably do to drag us into a war of their making. All it takes is for Israel to have a more aggressive prime minister . Seems like Hagel would respond to the reality of the issues and not to political party opinions. For starter, Sen. Hagel is a former senator because he chose not to run for re-election. He would have been a senator to this day had he continued to seek the office. Second, he is a decent and wise man who has the best interest of this country. He is frank and not beholden to any lobbyist, including the Jewish Lobby. We need to make a distinction here. His comments that are now being quoted about the powerful Jewish Lobby that most congressmen fear are frank and correct and the Jewish community knows it. 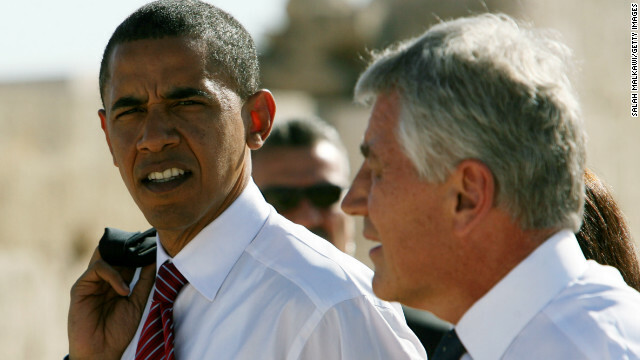 Mr. Hagel, like President Obama, is not anti Israel. He is going to be confirmed as the next Secretary of Defense and the State of Israel cannot afford to be wrong a second time, having fought hard against the re=-election of President Obama. Per McConnell, "What we're saying here is the biggest problem confronting the country is our excessive spending." But is that an accurate assessment or a distraction to just keep focus on one problem while irresponsibly and self-servingly allowing the continuation of what really caused our drastic problems? "Big government", government spending and the deficit are all problems needing to be addressed, problems that aggressively grew as necessary responses to problems initiated under Bush-Cheney, problems that would be allowed to repeat should their source be ignored. We need to get excited about cutting the deficit and controlling spending but being totally focused there and being blind to the irresponsibility and self-serving efforts to return to "more of the same", Bush-Cheney style, which can only result in "more of the same" is ludicrous. Each of our costly problems were the result of exploitation by the few, allowed by permissive policies, encouraged by co-responsible politicians, resulting in run-away greed, gross dishonesty and self-indulgence with the few always walking away with substantial gains and the country, the majority left with the significant costs – "puppet" politicians catering to "the money" and together their taking the people for granted as easily conned and as just "pawns" is the real costly problem that the people really need to firmly reject.